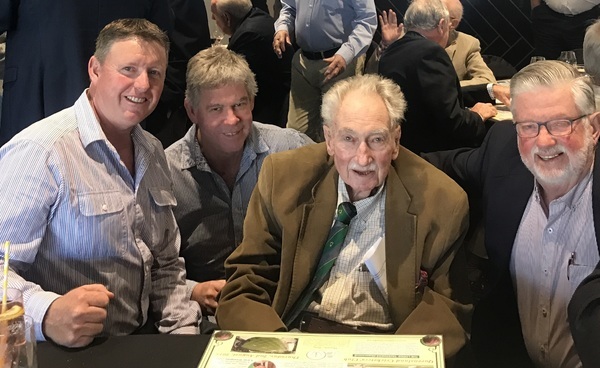 Legend of Queensland Cricket Lew Cooper took centre stage at the recent Lord''s Taverners Luncheon in his honour. He is pictured with Maryvale''s Kevin Bourke, Patrick Pattulio (Wanderers Cricket Club) and Bernie Pramberg. Recently I was fortunate enough to be invited to a special Lord’s Taverners Luncheon at the Qld Cricketers Club to honour the legendary Lew Cooper and also Bulls winning Coach Wade Seccombe. Among a host of luminaries were Darren Lehmann, Barry Maranta, Stan Gilchrist, Queensland Cricket CEO Max Walters and former Test Umpire Mel Johnston. It was a great tribute and I feel very fortunate to class Lew as a good friend. It is impossible to chronicle the achievements of the man as a cricketer, administrator and innovator. It is widely recognised and was acknowledged by all that attended that the contribution this man has made to Cricket will never be surpassed. Lew has been in very poor health but made it to the event and was humbled by the attention. More used to arranging these things than being the centre of attention. MC, Andrew Courtice recounted many of Lew’s achievements, while Max Walters acknowledged Lew’s roles in administration within Queensland Cricket. The current captain of his beloved Queensland University Cricket Club spoke of Lew’s influence on players past and present and the ongoing culture of the club. Former Australian and Queensland keeper John McLean also spoke of Lew’s impressive keeping record. The accolades and recognition kept coming from the Over 40’s and Veteran’s cricket – the Wanderers Club and of course Lord Tavernier’s Australia and a host of others. This is one extraordinary man and it should be no surprise he was awarded an OAM for his service to the game. Most mere mortals are happy to receive Life Membership from one organisation – Lew is a well deserving Life Member of a list of organisations a mile long, including Queensland Cricket. Wade Seccombe also spoke as a fellow keeper of his admiration for Cooper and also the influence he had on him as a young player and now a coach and leader. Next week I leave on my annual Wanderers Tour to Central Queensland. It will be a bitter sweet trip for many of us. For the first time in 42 years Lew Cooper will not be our Tour Leader. Unfortunately not well enough to join us. Missing will be the booming voice ordering us to our rooms, on and off our bus and herding us to various events. We are headed as I said to Central Queensland, however without Lew’s guidance and direction heaven only knows where we will end up and whether or not we will manage to make it home but I’ll keep you posted from “the Bus” or perhaps send out an SOS.